A few months ago, I wrote about seeing the “Memphis Belle” in California (my post), which is maintained by the Liberty Foundation non-profit. A friend had commented that I needed more details about the B-17 in my book in the parts where I was writing about my father’s stories from World War II. He was drafted out of high school and trained as a B-17 tail gunner for the 3rd Air Force. At the time of my visit to the plane in California, I inquired whether the “Memphis Belle” might ever get to Connecticut where my father lived. 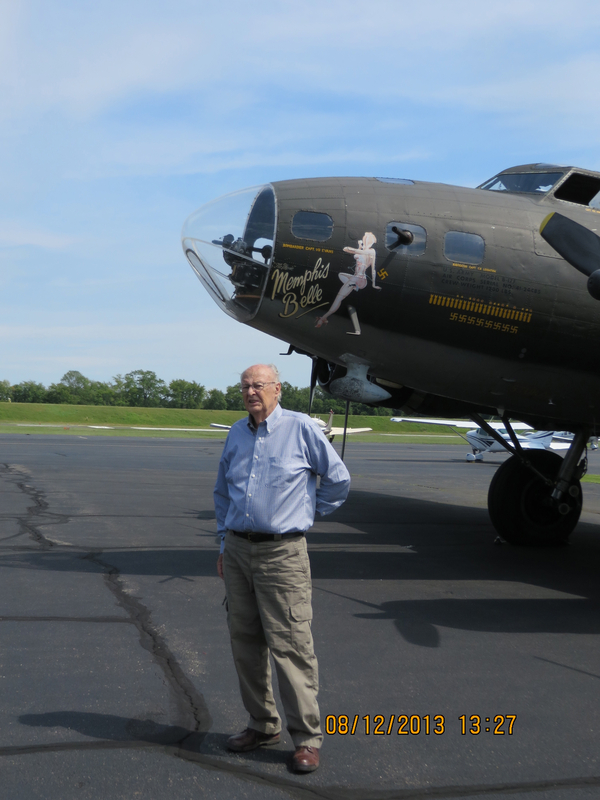 He had talked about flying in a B-17 again for years – like a dream he never imagined would come true. Amazingly, the plane was scheduled to visit Hartford-Brainard Airport in August, and the wonderful team offered my father a ride on the flight for media and veterans. He flew yesterday and had the time of his life! Let’s just say that my father, 87-years, was a kid again. He scrambled into the plane with a spryness that I hadn’t seen in years. “All the veterans look young when they see the plane,” said one of the crew members. She explained that veterans are apparently so happy to be back in the company of the “flying fortress” that wheelchairs, walkers, and canes, tend to disappear. I had to see it to believe it, because my father can barely walk up the stairs, and yet he cleared a ~2ft step to climb into the plane’s waist before walking the narrow catwalk over the bomb bay doors to reach the cockpit, where he sat behind the pilot and co-pilot throughout the flight. As the media scrambled all over the plane to take pictures as the plane circled Hartford, my father relived his memories. He told about turning the props before take-off, putting on an oxygen mask at elevation, and how he had flown the plane many times during his training missions (all crew members needed to know how to fly the plane in an emergency). He wondered what had happened to the men that he had trained with years ago, particularly the pilot of his crew to whom he felt the closest. My father’s joy is definitely the highpoint of this trip. I saw his emotions throughout, as I was with him the whole time! I had heard the stories so many times, read the books, and seen the plane. Yet, none of it compared to actually flying in an actual B-17 bomber! As soon as I heard the engines roar, I could imagine my father’s crew at their stations for take-off, checking in with the pilot over the intercom. While I was strapped into a seat in the waist of the plane, I sat next to the large .50 machine guns. ~70 years ago, men would have been watching the skies for enemy fighters, ready to fire. I only saw the friendly skyline of Hartford. My ride was a thrill, but for the airmen of the 1940s, it may have been terrifying (or death). May we never forget their sacrifice. The Liberty Foundation thanked my father for his service. “If it weren’t for you, we wouldn’t be here,” they said. My father sheepishly accepted the compliment. He had never left U.S. soil, but his crew had completed OTU and was waiting for their orders to leave for London when VE Day occurred. Fortunately, the orders never came as the European war had ended at that point. Upon chatting with the Liberty Foundation crew members, it turns out that the family members of veterans are among the most represented visitors to see the Memphis Belle. I count myself among the many who seek to understand what our family members endured during World War II. I highly recommend the Memphis Belle experience and applaud the Liberty Foundation, a non-profit, to keep the plane flying. It is an exceptional monument to our World War II heroes. « Predicting Popular Movies – Are Books Next?